An adolescent is tested for HIV in Côte d'Ivoire. Prevention and infection treatment efforts, Ms. Fore noted, are still missing the mark, specifically when it comes to “HIV transmission from mothers to babies,” she said. “Programmes to treat the virus and prevent it from spreading among older children are nowhere near where they should be,” she added. 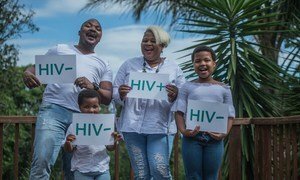 Furthermore, the report cites a global target reduction in the number of HIV-infected children by 2030 to 1.4 million, while the projected number today of 1.9 million, shows that the world is off-track by around 500,000. Two million new infections could be averted by 2030, if global targets are met—this means providing adequate access to HIV prevention, care and treatment services, and testing and diagnoses. The UNICEF vision for an AIDS-free generation entails upscaling family-centered testing to help identify children living with HIV who have not been diagnosed, and greater use of digital platforms to improve education when it comes to HIV and AIDS contraction and prevention. “We can’t win the fight against HIV if we don’t accelerate progress in preventing transmission to the next generation,” said Fore.